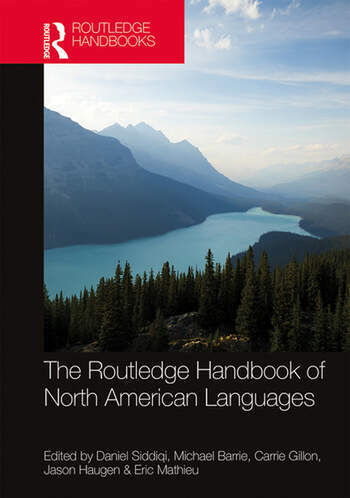 The Routledge Handbook of North American Languages is a one-stop reference for linguists on those topics that come up the most frequently in the study of the languages of North America (including Mexico). This handbook compiles a list of contributors from across many different theories and at different stages of their careers, all of whom are well known experts in North American languages. The volume comprises two distinct parts: the first surveys some of the phenomena most frequently discussed in the study of North American languages and the second surveys some of the most frequently discussed language families of North America. The consistent goal of each contribution is to couch the content of the chapter in contemporary theory so that the information is maximally relevant and accessible for a wide range of audiences, including graduate students and young new scholars, and even senior scholars who are looking for a crash course in the topics. Empirically-driven chapters provide fundamental knowledge needed to participate in contemporary theoretical discussions of these languages, making this handbook is an indispensable resource for linguistics scholars. Daniel Siddiqi is an Associate Professor of Linguistics, Cognitive Science, and English at Carleton University in Ottawa. His research focuses on stem allomorphy, metatheory and grammatical architecture, and non-standard English phenomena. Beyond editing this volume, he has edited The Routledge Handbook of Syntax and Benjamins’ Morphological Metatheory. Professor Siddiqi is also the lead designer of Carleton’s PhD in Linguistics, Language Documentation, and Revitalization which launches in 2019-2020. Michael Barrie is a syntactician at Sogang University in Seoul, whose work also includes the syntax-semantics interface and the syntax-prosody interface. Much of his work is based on extensive field work on Northern Iroquoian languages as well as some work on Algonquian languages. Outside of North America, Michael Barrie has also worked on Cantonese, Korean and Romance. Carrie Gillon is the co-founder of Quick Brown Fox Consulting and the co-host of the Vocal Fries, the podcast about linguistic discrimination. In a previous life, she researched the syntax and semantics of understudied languages, mainly indigenous languages of Canada. She wrote a book The Semantics of Determiners: Domain Restriction in Skwxwú7mesh, co-authored Nominal Contact in Michif, co-edited the Skwxwú7mesh-English bilingual dictionary, wrote or co-authored 8 articles and 3 book chapters, and co-edited three volumes of UBCWPL and a special edition of the Canadian Journal of Linguistics on noun phrases. Jason D. Haugen is Associate Professor in the Department of Anthropology at Oberlin College. His research on the Uto-Aztecan languages has been published in a number of venues including recent articles in Anthropological Linguistics, the International Journal of American Linguistics, Language Dynamics and Change, and Linguistic Inquiry. Éric Mathieu is Professor of linguistics at the University of Ottawa. He completed his Ph.D. in 2002 at University College London. His research focuses on French (Modern and Old) and Ojibwe (an Algonquian language). He has published in Linguistic Inquiry, Natural Language and Linguistic Theory, Syntax, International Journal of American Linguistics, Journal of Linguistics, Lingua, Probus, Studia Linguistica, and Linguistic Variation. He is also the author of numerous chapters in books (with Oxford University Press, Cambridge University Press, John Benjamins, Routledge, and Springer, among others) and co-author of several books; a monograph on island effects entitled ‘The syntax and semantics of split constructions’, a special edition of Lingua on noun incorporation, an edited volume on Romance languages ‘Variation across and within languages’, and a forthcoming book on plurals.